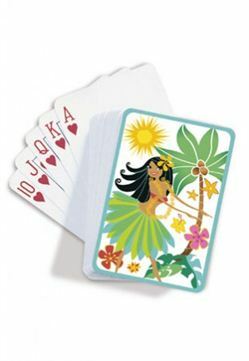 Bring a piece of Hawaii to your card game with these Island Hula Honeys Playing Cards. These make a perfect gift from the Hawaii or souvenir to keep. Each deck includes 54 shrink-wrapped cards and comes in an acrylic case for easy storage. Cards measure approximately 2-1/4" W x 3-1/2" H.